White Boots: Will You Be Wearing Them? 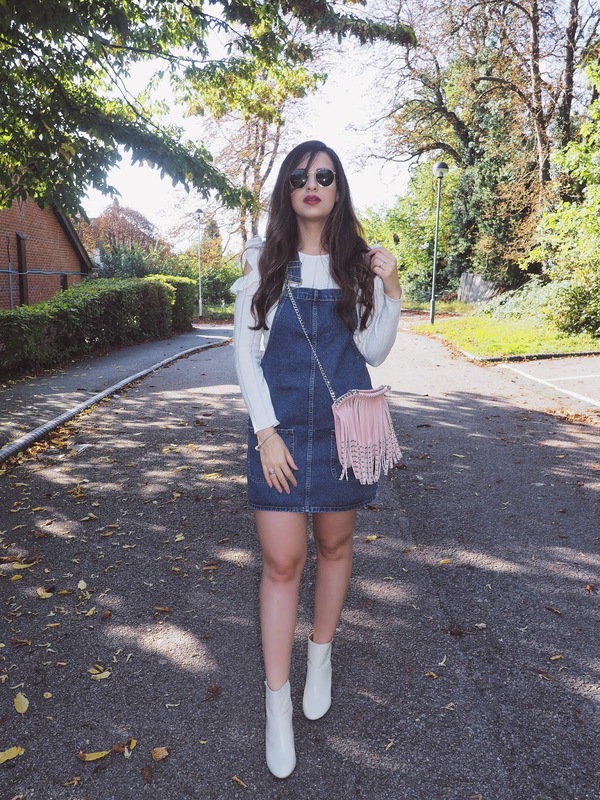 There are many boot trends we can expect to see this season, and I must say I am a fan of most of them (minus the slouch boots, what are those things?!) but let's talk about white boots today because despite originally thinking they'd be really hard to pull off, I cannot seem to stop wearing them! "Like Victoria Beckham said, the white boot feels new and fresh this season, and it will be the pair to have in your arsenal of winter footwear". 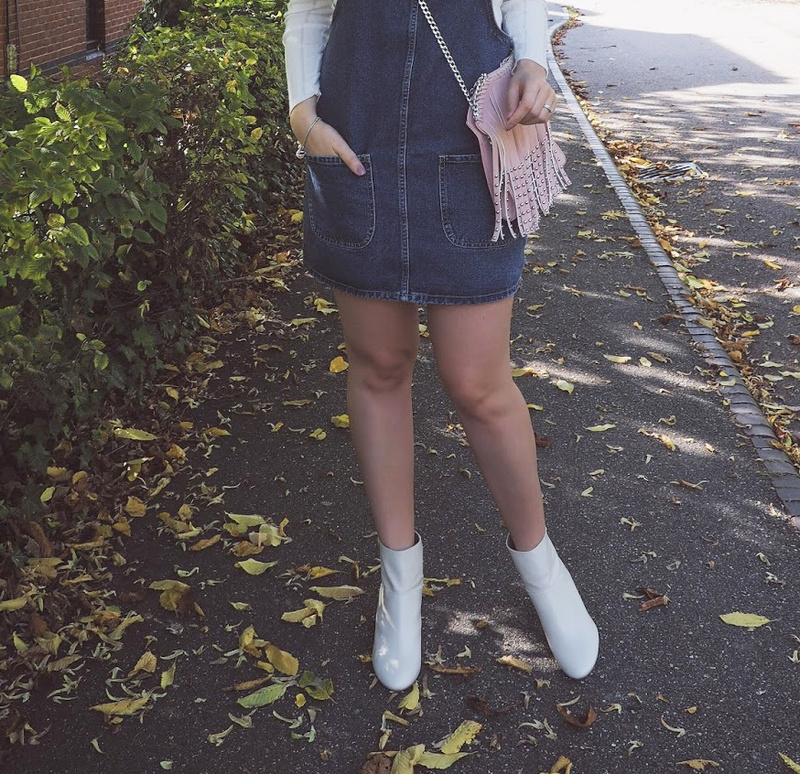 White boots have been on a high for quite a few seasons now, so they're not exactly groundbreaking anymore but the trend has reached such a fever pitch that I can't go without mentioning that they're everywhere yet again this season. Designers like Marc Jacobs, Céline, Narciso Rodriguez and Victoria Beckham all displayed white boots in their catwalks and we can take the hint; it's time to lighten up and ditch the usual black ankle boot. White boots are proving to be timeless and worth the investment. Not only you can wear them this entire fall season, they work amazingly well with spring and summer too, so there's a pair you will be rocking all year round. The white boot doesn’t feel as heavy or tired as black, yet it still offers the same style and warmth against the cold. Like Victoria Beckham said, the white boot feels new and fresh this season, and it will be the pair to have in your arsenal of winter footwear. 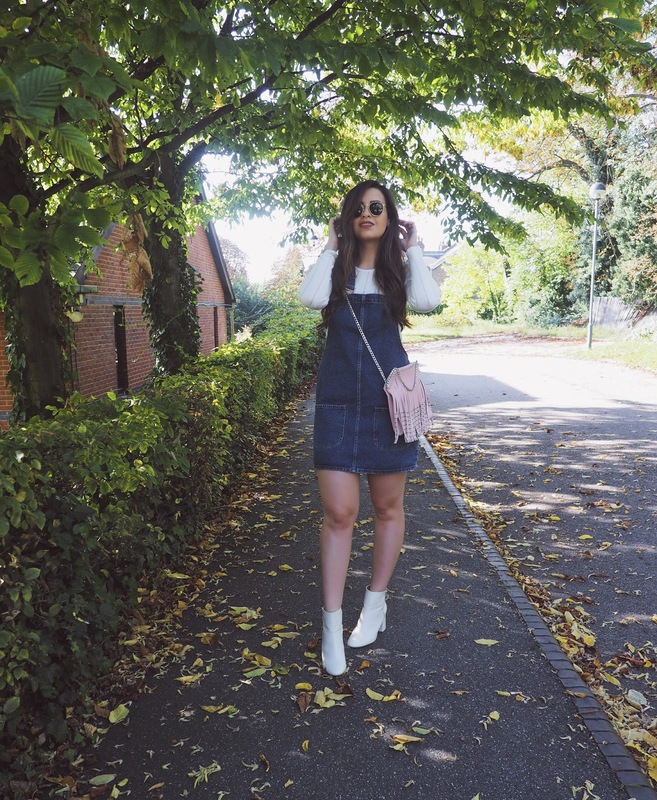 I managed to get the pair I am wearing here on sale, before even fall was on the horizon, and you won't believe me when I tell you I got it for exactly £9.99 from Stradivarius; a bargain I know! Granted they aren't exactly white, more like an off white shade, but for the price I could barely pass them up. I can't help but think they're the perfect alternative to the tired old black style, especially for those rare but beautiful sunshiny winter days. Now that I finally own a pair I know what the fuss is all about; these boots are incredibly versatile and I cannot wait to wear them more and more! Check out my previous outfit with them here for more inspiration. How do you guys like this outfit? I am in love with every single piece! Let me know whether you will be wearing white boots this season below! Thanks for reading beauties and wishing us a great week ahead! I love love love how you have styled this look. I don't think I'll be jumping onto the white boot trend. I can just see it not suiting me, but it suits you perfectly. Loving that sweater with the cold shoulder details. Yes to white boots and I am searching for a pair for myself! I may be a little boas though because I love white in general. They look super cute on you! I love it... Although I will be extremely scared messing them up. I like off white, ad I had a pair of white boots sometime ago - I love white boots, but we have to walk with sooo much care! Nevertheless, they are so cool, you look very beautiful! 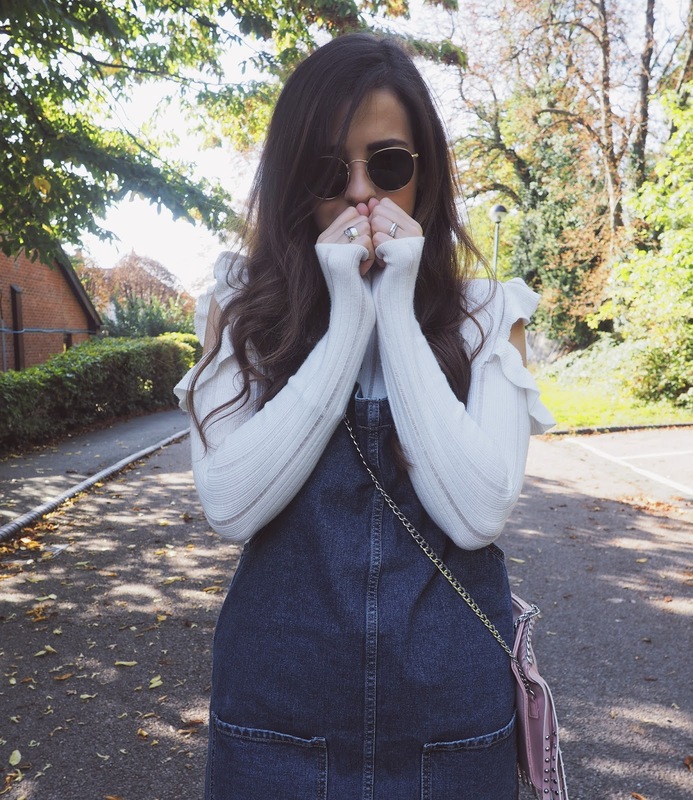 Loved the bag and the dungarees! Stradivarius for 9,99 pounds??? That's amazing! Well done! I am OBSESSED with boots - so probably will own a white pair at some point. I often struggle to find boots in my size as I have large feet. hahaha, I remember slouch boots were SO popular when i was in high school! i recently bought myself a pair of white converse, i never thought i'd like white shoes either but they're my favorite! white definitely adds a fresh look in comparision to dark shoes. I need new boots, and while I am trying to be sensible and buy dark ones for versatility, I am drawn to the white ones you see around. They are just so fresh and 70s! I guess it is safe to say I am undecided if I am going to wear them or not! You rock the white boots so well! I definitely like how you can easily wear these into Spring and Summer too. Your outfit combination with these is just perfect...and what a bargain! Great outfit pictures! I definitely wouldn't trust myself with white boots! I have pale pink ones and I only wear them occasionally! I would get them dirty too quickly but you look amazing in them Pam! Quanto ao look, gostei muito! Uau, são tão giras, querida. Foram mesmo um achado. Estás linda, como sempre. Need those boots! 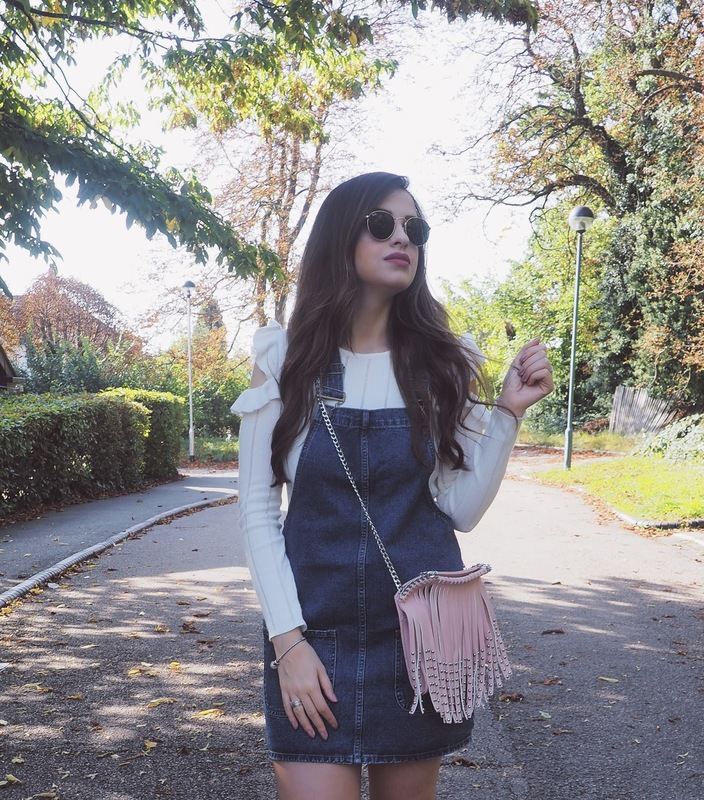 So fab - love with the denim overall dress!! I can only just about manage white trainers haha! You look incredible in them though girl! You look amazing in these boots! For me it's a no as I can't keep black clean lol! I do really like them though, maybe give them a try for just one night!